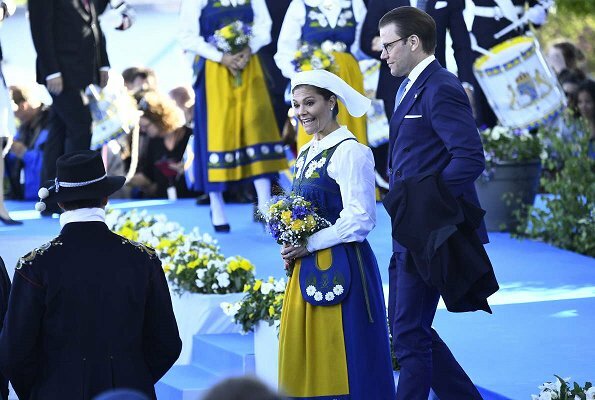 On June 6, 2017, King Carl Gustaf, Queen Silvia, Crown Princess Victoria, Prince Daniel, Princess Estelle, Prince Carl Philip, Princess Sofia, Princess Madeleine of Sweden and Christopher O'Neill attend the 2017 National Day official celebrations held at the Skansen open-air museum in Stockholm, Sweden. 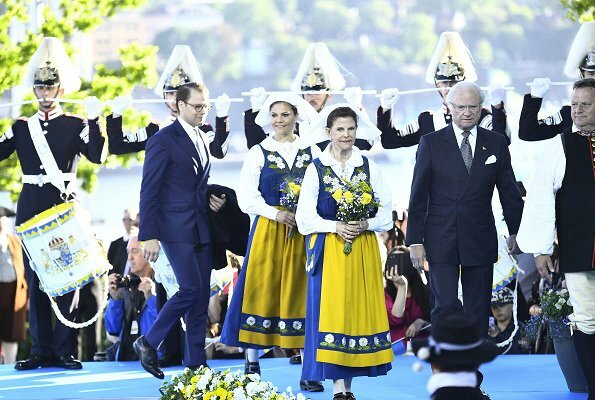 King Carl XVI Gustaf, Queen Silvia, Crown Princess Victoria, Prince Daniel, Prince Carl Philip, Princess Sofia, Princess Madeleine and Christopher O'Neill attended National Day reception at Royal Palace in Stockholm. Man Christopher O' Neill needs to lose weight, he looks so old and flabby now. He looks a man in his fifty! Actually, I think he has lost a few pounds. Swearing in Florida for a few weeks will do that to you. However, he has aged quite a bit. Rumor is his business is not doing well. He's aged 20 years just since their wedding in 2013. He needs to lay off the cigarettes as well..
Gosh, Someone says something about Sofia, dear lord the comments. But its OK to say Mr. Oneil is "old" and "flabby". Cigarrettes? Sure, its bad for you. His apperance? Yes attractive to his wife and most important, to himself. Madeleine should ditch her heels with that costume!! It's not very traditional. They all look lovely with their looks, but faces like very much "under pressure". Only Sofia looks really happy (and Estelle!). Something wrong in Sweden?? Something wrong in Sweden? You should ask Trump!!! Not going into politics but remember the hullabaloo a few mounts ago about something he said about Sweden? And yes, Madeleine looks out of place in the heels when all the other wear flats with the costume. Rainha Leonor - everyone knows smoking ages a person. That's why I said Chris should should lay off the smoked. And he has lost weight in my opinion in recent months. He appeared heavier over the holidays if you look back on old photos. Shut up Lizzie. Nobody cares about your biased opinions. See Lizzie, it is good, that we all should just talk about fashion here. Because when we talk about politics, the moods are going high, ha ha. I am sad to notice that Chris has aged a lot, he looks like a 58 year old, and unfit at that. Pourquoi les femmes en costumes traditionnels et non les hommes ? It's not customary for the men to wear traditional costumes in Sweden. Mostly musicians and dancers do only. Every year Madeleine wears the wrong shoes. Every year. Her way to try to get attention? Coralie, yes, and with that artifical grin in picture 7. What does she want to proof?? Not necessary a all. Raquel; Maybe Sofia realized just when was time to go out that her feet were swollen by pregnancy and took the next possible flat pair. 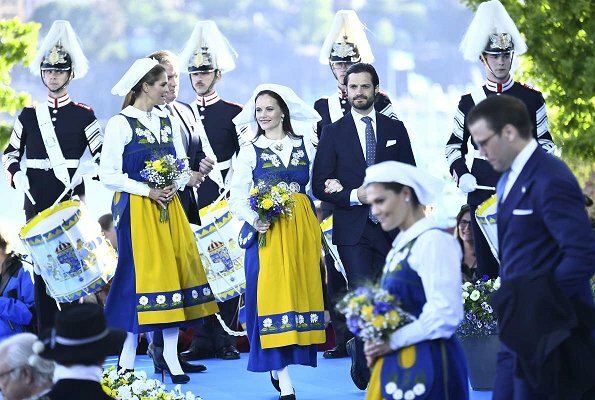 Also she wore pumps in 2014 http://jurnal.md/ro/divertisment/2015/6/13/nunta-regala-in-suedia-se-casatoreste-printul-carl-philip-cu-fostul-model-sofia-hellqvist/. I guess youre argument is not valid. OK, it just came to my mind, I had swollen legs in every pregnancy myself. P.S. I looked what our policy is to those dresses what have such a buckle shoes Silvia and Victoria had, there is written shoes can be those buckle shoes, binding (maybe not correct word) or pumps. To my surprise there is no mention of how high heels are correct. Those instructions come from out official heritage textile institution. After my reading I think even Madeline has here right shoes what I did not think before. Blondiini, your comment is that she wore this ones this year because of pregnancy. That argument is still not valid, she wore the same last year and she wasnt pregnant. Also she wore pumps in 2014. It has nothing to do with pregnancy that's my point. Some are more tolerante about shoes and such. Some people are more traditional. Only Victoria and Silvia are wearing the traditional shoes. The 'right shoes' I guess it depends on people's perpectives. Raquel, I understood, it was more writing my thinking. If it is in Sweden as it is here in Finland they all had right kind of shoes really. I did not remember what shoes Sofia had last year but what Madeline had. Madeline has had those high heels so far I remember so I do not think she will change anything. Sofia wants to please more, she could go to traditional ones. So what. Madeleine's shoes are a lot nicer than the old "clunks". She is far superior to her sister-in-law in every aspect, besides being well educated which Sofia is not. Stiletto pumps are a strange combination with folklore dresses. Especially with white stockings. Horrible. 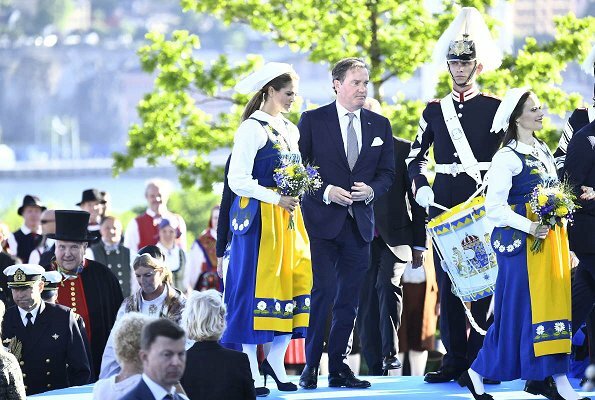 I have never seen anyone in Sweden wear such shoes with a traditional costume. Never. The tradicional ones arent pretty but its tradition. She should try yo wear them some time. Madeline does the same every year, she has always high heels with that traditional costume. Madeleine does not wear stiletto pumps. In my country we can wear different kind of traditional footwear with folc costume, including heels (but they should be plain-looking, nothing flashy nor bling-bling). The only thing that does not go with the national costume are the running/training shoes. Wearing sneakers is big no-no-no. At the song and dance festivals we see this kind of shoes like Madeleine wore often. Especially younger women wear heels, but as you get older, then more comfortable shoes are choosen or if you have to dance then lower heels are in order. So I don't quite get this chafe towards Madeleine's shoes. They look fine and I'm glad this time she wore her hair in a ponytail. What's the head covering supposed to mean? Or does it mean anything? A married woman wears a head covering while a single woman has her hair uncovered. Married women wear head coverings, single women do not. 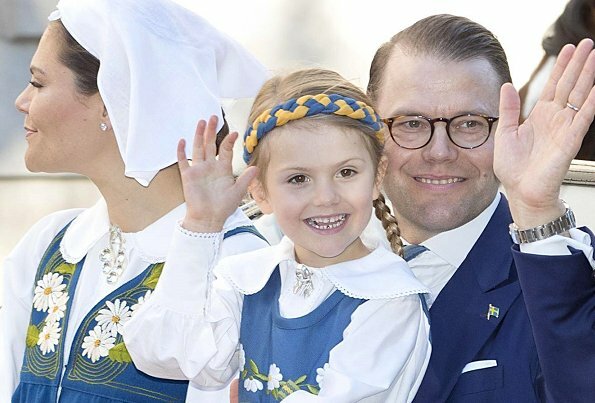 Lizzie, it comes together with the national costume in Sweden! Married women wear those headgears. Unmarried have bands around their heads. Wow, Chris looks terrible. This is what the long term side effects of an unhealthy lifestyle and smoking does to you. He looks like Madeleine's father. I have thought that for a while now. They may well be a good match and lead a happy life, but they look odd together. And it´s only getting worse. Married women wear the head scarf. If you look at pictures from earlier years none of the princesses wore them as unmarried women. A married woman wears the head covering while a single woman has her hair uncovered. Chris is a very good looking man and he and Madeleine make a good couple with 2 beautiful children. 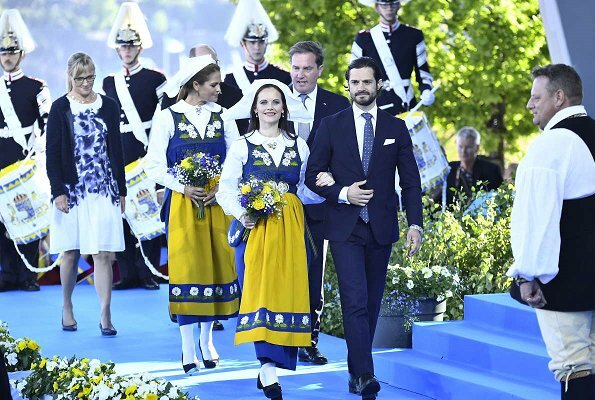 Sofia and Carl Philip look great too, and Daniel and Estelle. Victoria always seem to be a little too full of herself. Why the ladies always wear the same national costume on this 6 June event? I have to say its getting so boring to see the same outfits on women every year (and men in regular suit). I know they own other national costumes, so why not wear something else for a change? And I must agree with comments about Chris - somehow it looks like he has aged 10 years in recent months. He looks so old compared to Madeleine. Although I feel a little sorry for him. When he didn't attend last year, he was under critisism that he's not attending. When he attends this year, he's under critisism that he looks so old and "flabby". 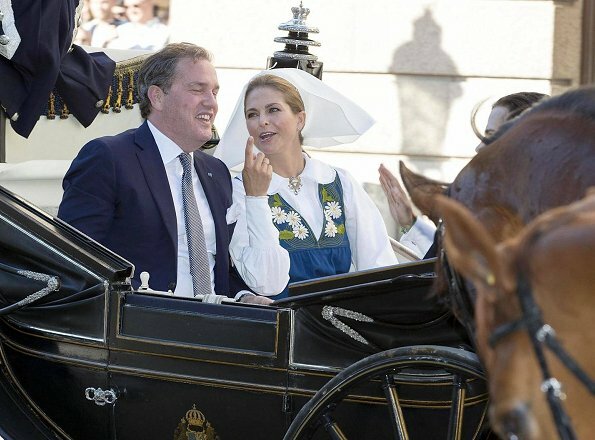 Its not easy to be married to the Swedish princess! Poor Chris. He is always critized, he can even gain a few pounds. Well, when you dont have the taxpayers and you have to pay your bills yourself, life can aged you. No wonder why everybody else looks so young and fresh. Coralie, the man wants to work for his family. 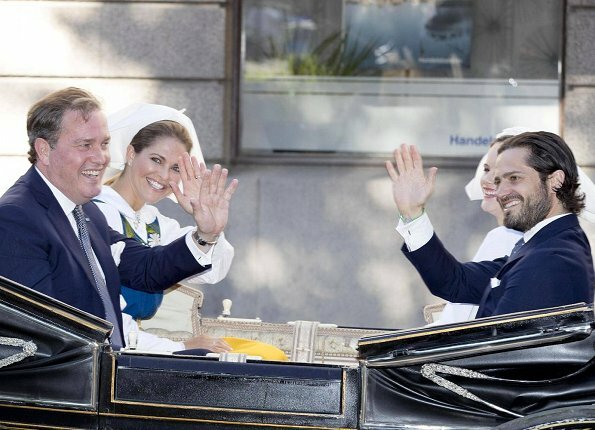 It would be very easy for him to become HRH Prince Christopher of Sweden, Duke of... But he chose to work and not to live off his wife's family money. He deserved my respect I feel. Raquel, I think there are a lot of definitions of "Work". I think what Chris O'Neill earns money with is something that not everybody calls work. And he forgot (?) to pay taxes at least two times, as far as I know. Probably true. But lets not forget that people that have to work for themselfs get late on their bills some times. Do you know who doesnt? The royals, cause they dont even pay taxes. At least he contribue for society and works. Again talking about Chris's taxes! The Florida home is owned by the whole family, he is one of the owners and the tax is not under his name. The whole family pay the tax late not him only. He takes the blame on himself. I am here to compliment Chris. He lost his job because of this marriage and he got the guts to run his own business.The easiest job is being a royal, don't have to worry about paying tax, living a good life and Chris choose a difficult life by being a private citizen, running his own business. This man got the guts too to marry the most problematic princess, the "black sheep", I think he deserves respect and not criticism. Did anyone watch the show, I strongly recommend everyone to watch it. 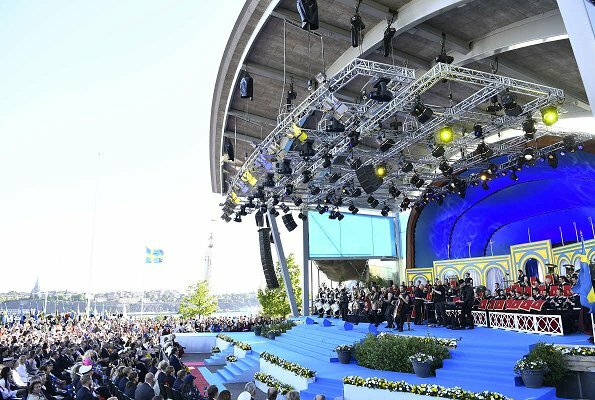 (it's on SVT now) Lots of people criticise him for not speaking Swedish, but he sang the King's song and the Swedish National anthem that day, I applaud him for doing that. He looks good in video, in live action, he does not look old and flabby and he looks very sweet and adorable when he smiles. Again, Chris is never photogenic. 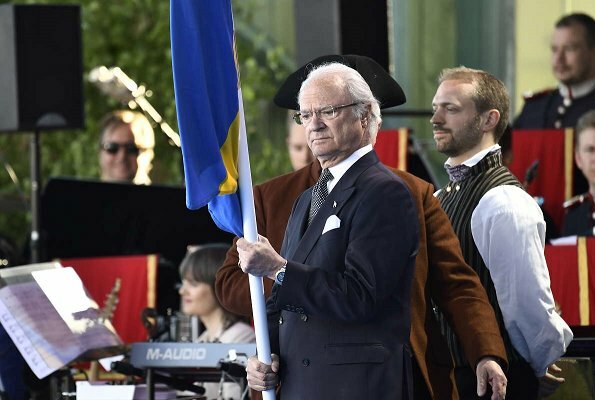 There is something bad I want to point out about King Carl Gustaf. He did not shake hands with the children on the stage, is it because these children are black?? ?Watch the video on SVT and see the difference between Chris, the foreigner son-in-law and the King himself. Coralie, are you saying that Christopher O'Neill isn't working and he earns his money somehow falsely? Please tell more. Regarding not paying his [property] taxes: he was late but he has paid evrything now (even businessman can have money problems and not have cash at hand all the time). There were also speculations that those property taxes have different deadlines, and he actually wasn't in debt at that moment. Don't know all the nuances, so can't argue. Besides like Raquel said he could have easily lived off from his wife and tax-payers but he choose to work instead. What he got in return, sleazy mags writing doubtful stories about him and his looks under constant scrutiny. I feel sorry fot the guy. Marianne, I think "The bonfire of Vanities" by Tom Wolfe describes how Chris makes money. And I think it is an illusion to believe that he could easily live off from his wifes family. As a member of the royal family he had duties and in case of a divorce he had nothing. He is a smart guy and acts to his benefit. @Coralie, what that movie has to do with Chris and explains his "work"?? Lots of people don't call what royals do serious "work", yet, they get their income from it. Should we scorn their position, perhaps even call them parasites? I have many friends who work in the banks & investments firms and they know in detail about financial market and investments. I've asked for their advise myself and I was glad they could help me. I don't think those people are crooks or dishonest because they work in this field of work. And if Chris used his position badly or somehow misused money trusted to him, I'm sure the Swedish press would write about it first! Perhaps it would have been good if Christopher O'Neill had been a brain surgeon or top scientist but neither were Daniel Westling or Sofia Hellqvist? Grazia, Chris didnt chose a difficult life. He chose a more difficult life compares to being a royal. "Guys who work for real" ??? Why? Working in finances is not working for real? Is royalty working for real then?? 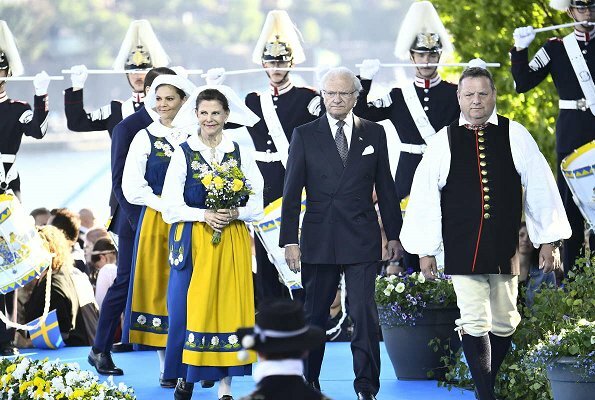 I like the way Queen Silvia and Victoria dress in the traditional dress, right down to the correct shoes. 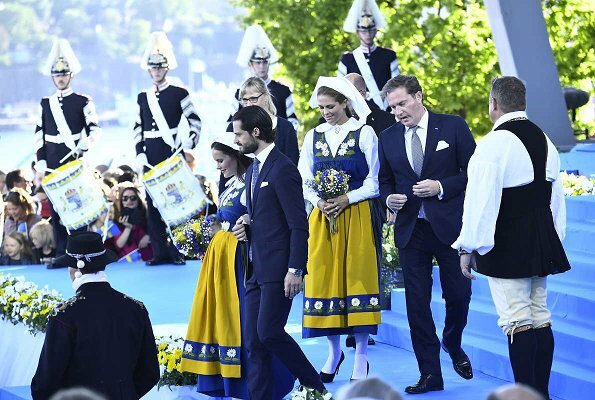 I have to admit, I find it annoying that Madeleine as a Swedish Princess doesn't own a pair of traditional shoes. I know Sofia's aren't traditional, but they look a lot better than stilettos. Karl, you are right as always!! But do not forget, Daniel! has a serious!! kidney-problem. It is typical then, to have thinning hair and bags under the eyes. And don't ask what wonderful medicaments he has to take. I speak from own experience. Chris is the typical money-man from the City of London (in my humble opinion). Karl, you are right. Not only Chris has aged, Daniel has aged a lot too. His slicked down hairstyle isn't helping to hide his thinning hair, his glasses look good on someone in his 60s, and I guess there's nothing to be done with those bags under his eyes. Hope his kidney keeps up and he won't get worse. And I hope Christopher will hire a personal trainer and a nutritionist. You have two young children and wife, so don't neglect your health like this, man!!!!! 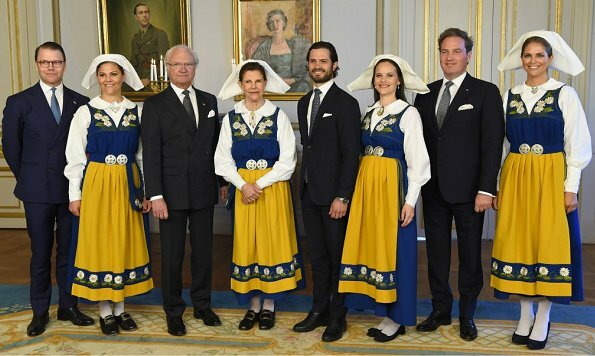 I think it looks strange that only the women wear the costumes, even if it is "what is done in Sweden". If it's a national costume then why doesn't everyone wear it? And the stiletto heels with the costume look plain silly. Useless masquerade...nothing to do with fashion. They d better make public appearances visiting people in hospitals or something like that.It would have more sense. Every country has full right to keep their own traditions celebrating such things as national day. Swedish have this and Norwegian rather much similar. To them it is not useless masquerade. Of course it does not need to be to do anything with fashion. Chaque pays à sa fête nationale à sa convenance .En France on a un défilé militaire ,il reste beaucoup de jours pour aller dans les hôpitaux. @blondinii i thought this was a blog about fashion not about National Days @miriam : je sais bien que chaque pays a ses traditions, cependant meme une tradition devrait avoir un sens, se masquer avec une veste traditionnelle et garder les décolleté je le trouve ridicule. Maybe my english is not perfect: i mean : if this is a fashion blog those pics have nothing to do with fashion, maybe just because as you say they are eternal.that was what i meant. Fashion is something in continuous evolution to me. And i said that i would prefer to see the royals involved outside rather then always so concentrated on themselves.Bye. Chris looks great and don't have the plastic expression like the Daniel. Chris smiling face lights up his whole face, but poor Daniel is too afraid to laugh - too many facelifts and fillers!? What a comedian you are Anna-Marie! Anna-Marie, you had me laughing with your comment about Daniel :) But you are right: when Chris smiles, then his smile looks sincere and his whole face light up. Marianne: ??? Are you honest here? rainha leonor, sorry but I don't quite understand your question. If you ask if I was honest when telling that I think his smile is sincere then, yes, I think his smiles are sincere. There are royals who smile with their mouth but their eyes aren't into it and those i call insincere smiles (they smile because its expected). 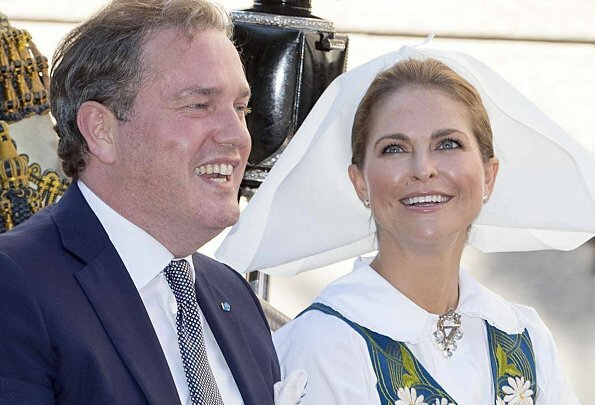 Cannot believe we have really 82 comments, many so negative, in tread where the subject is happily smiling Swedish royals in event they all seem to be very comfortable and having good time.